With its rich history, Muscatine has a number of annual events which highlight the distinct character of this charming river city. Events in Muscatine give families and friends the opportunity to enjoy many benefits the city has to offer. Take a look at the events listed below. We hope you will join us for some of our community’s most enjoyable gatherings. This eventful weekend includes ragtime concerts performed by talented musicians as well as eagle watching on the Mississippi River. Come view the majestic eagles near Lock & Dam 16 and enjoy some ragtime tunes. Click Here for more information. Start the summer out with this annual bike race through Weed Park on Sunday of Memorial Day weekend. This 14-36 mile race is part of a trio of races that start in Burlington, Iowa on Friday and end in the Quad Cities on Monday. The Muscatine Soccer Club’s annual tournament is held in Muscatine’s award-winning Muscatine Soccer Complex. Teams from all over the Midwest come to Muscatine to compete in the sport. Visit the Muscatine Soccer Club’s website for more information about their program and soccer tournaments: Here. Muscatine’s Independence Day Celebration includes an afternoon and evening of family fun. Fun includes a Children's Parade, Soap Box Derby, the traditional 4th of July parade, musical entertainment by the Muscatine Symphony Orchestra,—all set on the banks of the Mississippi River and in Historic Downtown. Enjoy the region’s largest fireworks display as it lights the night sky and reflects on the Mighty Mississippi. The Muscatine County Fair—a true old-fashioned County Fair—is held at the fairgrounds in West liberty each summer. Go to the fair to enjoy great music, exciting car races and a demolition derby, as well as the thrill of the Midway during this five-day event. From 4-H and agriculture showings to community booths, the Muscatine County Fair has something to offer everyone. Click Here for more information. Come experience life during pioneer times at Wildcat Den State Park. Enjoy storytelling, old-time mountain music, homemade ice cream, antique machinery displays, fresh apple cider and tours of the 160-year-old grist mill during the Heritage Day Celebration. Learn more about the fur-trading era by visiting the Buckskinners Rendezvous in the upper picnic area. It is fun for the whole family. Admission is free and food and beverages are sold on site. Get an early glimpse of the downtown merchants’ holiday décor and gift selection. There are special offers at select locations. Holiday Open House is hosted by the Downtown Action Alliance. For more information about the Downtown Action Alliance, click Here. Taking place the first weekend in December, the Holiday Stroll draws thousands of people to Muscatine’s historic downtown shopping district. 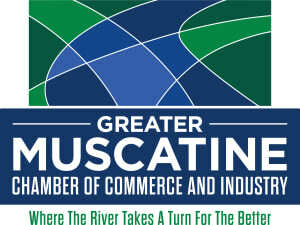 Usher in the holiday season by taking part in this festive event in downtown Muscatine. The Stroll includes decorated window displays, musical entertainment, food, trolley rides and the best in Midwestern holiday spirit. Each year’s Holiday Stroll is hosted by the Downtown Action Alliance. For more information about the Downtown Action Alliance, click Here. These highly popular concerts are held throughout the year and welcome a variety of distinguished musicians to the stage. From the Vienna Choir Boys to Roger Williams and Bobby McFerrin, this fine concert series offers something for everyone. For more information, please contact Wesley United Methodist Church at 563-263-1596. The Muscatine Symphony Orchestra’s mission statement says it all: “The mission of the Muscatine Symphony Orchestra Association is to enrich the cultural life of the Greater Muscatine Community by presenting and maintaining symphonic music of the highest quality and by providing comprehensive music education opportunities to the Muscatine area.” Visit the Muscatine Symphony’s website for the season’s schedule and ticket information. Most performances are held at the Muscatine Performing Arts Center, located within Central Middle School at 901 Cedar Street. One of the two Muscatine Farmers’ Markets is held each Saturday morning at the corner of 3rd and Sycamore Street. The other market is held each Tuesday afternoon in the spacious parking in front of the Muscatine Mall on Park Avenue. Enjoy the thrill of stock car racing at its finest at the Muscatine County Fairgrounds in West Liberty. Races are held every Saturday night with special races during the Memorial Day and Labor Day weekends and Tuesdays.